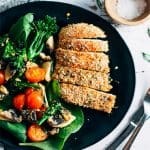 This super healthy protein packed Chicken and Kale Stirfry is a weeknight dinner you can get on the table within 15 minutes. 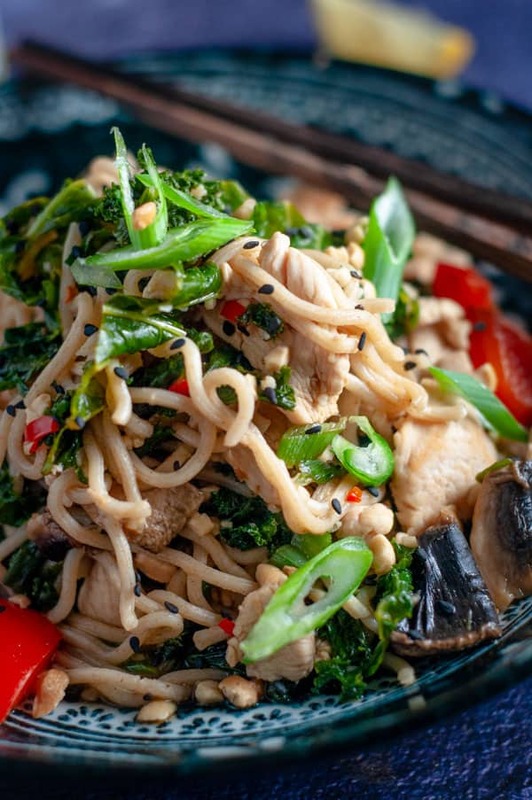 With hints of soy, garlic, ginger and lemon juice, combined with crunch vegetables and wholegrain noodles, it makes for great leftovers for lunch the next day as well. Have your chicken already prepped and ready to cook. For me this means I have it already cut into strips, in the right serving sized in a ziplock freezer bad. All I have to do is get it out of the freezer, defrost it in the microwave for a few minutes and its ready. Don’t be too precious with your veges. In addition to the Kale, I used capsicum (peppers), mushrooms, spring onions, but really you could used whatever you have in the fridge: carrots, Asian greens, zucchini. Don’t spend too much time preparing them, just chop roughly into chunks. 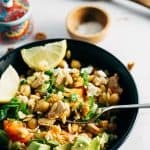 Its all about quick for this recipe. Keep your pantry and fridge staples stocked. I always keep crushed garlic, grated ginger, soy, bottled lemon juice, and chilli paste in the fridge as I use them so frequently, and I’m never without them. Because I buy them in bottles, they also keep for ages. Use precooked noodles. I prefer to buy the Wonka brand of precooked noodles that come in a pack of 2. These are very easy to use and taste great. They don’t require any prepping and all you need to do is add them at the end of the recipe to heat and stir through. 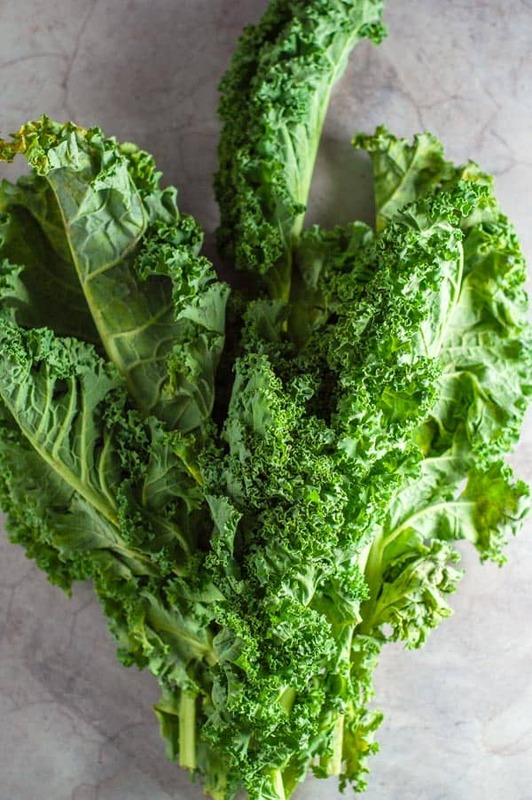 Kale is full of fibre which helps to keep you fuller for longer and to manage your blog sugar levels. It’s also packed with iron and vitamins that help to keep your energy levels up. 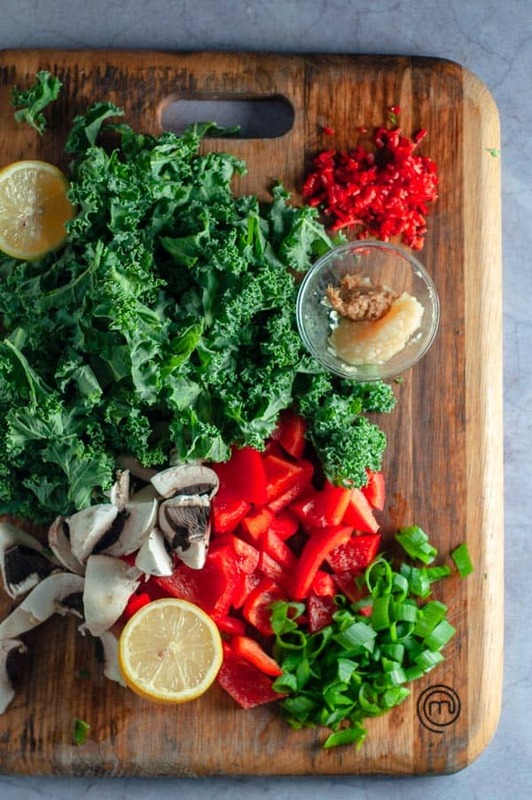 What does Kale taste like? Kale can taste bitter when eaten on its own. Lemon, soy, garlic, ginger all work well to add flavour to savoury kale dishes. The stems of curly Kale should not be cooked or eaten as it is tough, fibourous, bitter and unpleasant. Cut or tear the leaves off and discard the stems. You can Blanche it in water then add it to a stirfry, saute it with onion and garlic as side dish, or add it to baked dishes. 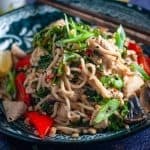 More Quick Stirfry Recipes >>>> Chilli Chicken Thai Basil Stirfry, Satay Beefy Noodle Stirfry, Cashew Nut Chicken, and Super Quick Chilli Garlic Beef and Broccoli. 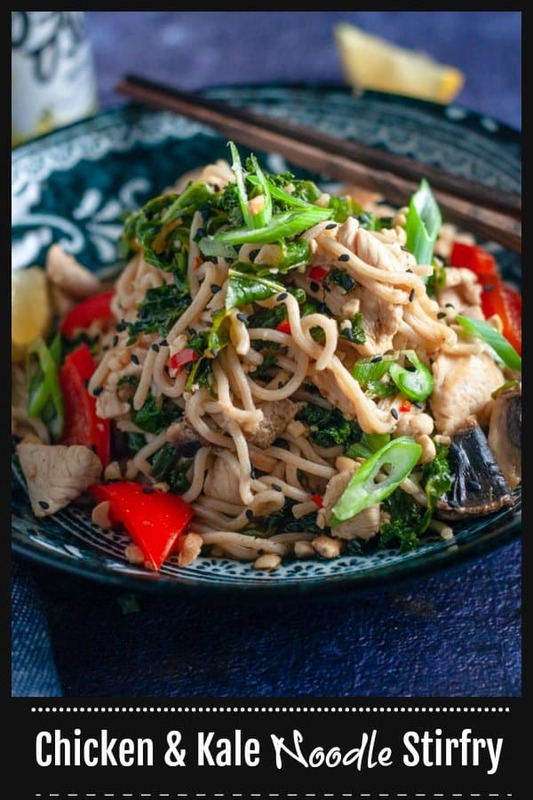 This Chicken and Kale Stirfry is great to make because it’s so flexible in that you can use whatever veges you have. PRO TIP: If you can’t get your hands on Kale, try using spinnach, bok choy, pay choy, or any of the other leafy Asian greens. 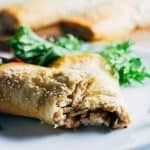 Want To Make This Recipe Low Carb? Instead of wholegran Wokka Noodles, grab your spiralizer and make some Zucchini noodles. Blanch them in boiling water for a couple of minutes and add them to the stirfry at the very end and stir through. Heat a wok on high and add the peanut oil, followed by the thinly sliced chicken, chilli and half of the garlic and ginger. Stirfry for 3 to 4 minutes until chicken is cooked. 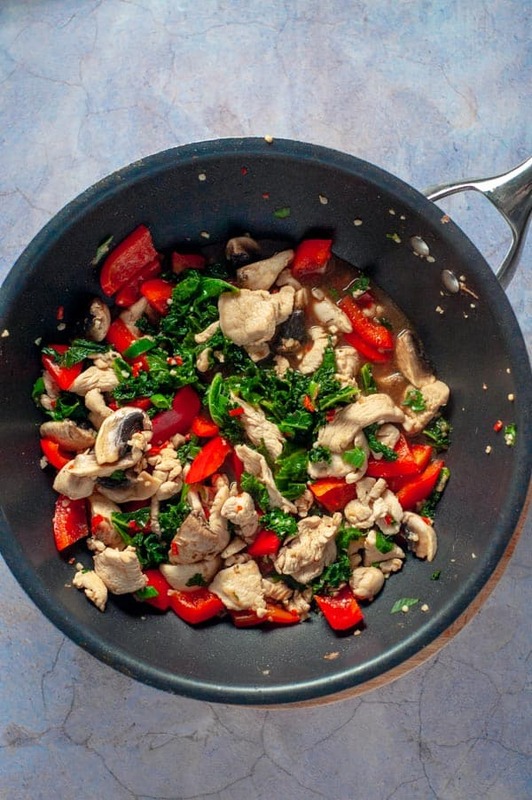 Then, remove chicken from Wok and set aside in a bowl. Add the chicken stock/broth, remaining half of the garlic and ginger to the wok, followed by the kale. (ensure you have removed the stalks from the kale as they are bitter, tough and not pleasant). Stirfry the Kale for 3 to 4 minutes until soft. Add the capsicum and mushrooms with the soy sauce, kecap manis and lemon juice. Stirfry for 2 minutes and add the chicken back in and stir through. Add the noodles and spring onions and stir through until they are mixed through. 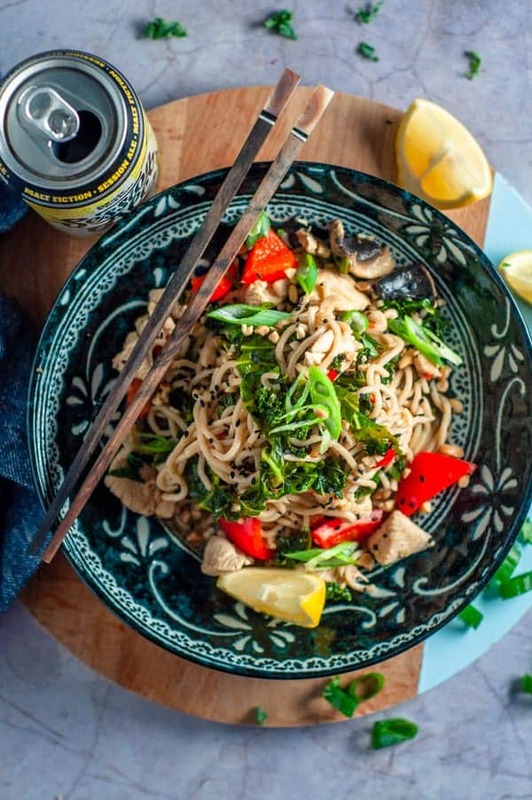 To serve, use tongs to place the stirfry in a pile on your favourite plate or bowl. Garnish with black sesame seeds, granulated peanuts, and some extra spring onions if you have some leftover. 1. Kecap Manis is a sweet soy sauce available from the Asian aisle of most supermarkets, usually where you find the regular soy sauce. It acts to balance out the savouriness of the lemon and soy in this dish. 2. I like to use fresh lemon juice in this dish for freshness, but you can also use the lemon juice that comes in a bottle for convenience. 3. Wokka noodles are in the Asian aisle of supermarkets. Go for the wholegrain ones if you can. I bag of noodles comes with two individual noodle packets inside. I used one packet for this recipe which was plenty.